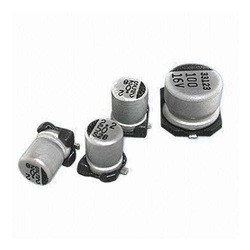 We are the leading institutions indulged in wholesale trader & supplying a premium range of Electrolytic SMD Capacitor. Entire range is lauded for its quality, strength, durability and performance. Offering you a complete choice of SMD Capacitors. Surface Mount Device, SMD capacitors, often referred to as Surface Mount Technology, SMT capacitors are small, robust and easy to place automatically which makes them ideal for today's manufacturing environment.SMD capacitors are used in vast quantities within the manufacture of all forms of electronic equipment. All types of SMD capacitors.